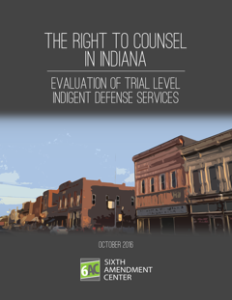 Pleading the Sixth: In October 2016, the 6AC released its evaluation of trial level right to counsel services in Indiana, detailing how and why the Indiana public defense system results in the actual and constructive denial of counsel to the indigent accused in courts all across the state. In 2017, an independent 17-member Indiana Task Force on Public Defense was appointed to propose solutions to deficiencies identified in the 6AC report. After more than a year of study, the Task Force released their report urging reforms “critical in nature” requiring immediate action. “[T]he county-by-county creation of public defender systems has resulted in a hodge-podge of several different and, in many instances, unaccountable systems. This can lead to systemic barriers to the fulfillment of the State’s duty to provide the effective assistance of counsel, such as overwhelming caseloads for individual public defenders,” stated retired U.S. 7th Circuit Court of Appeals Judge John Daniel Tinder, chair of the Indiana Public Defender Task (“Task Force”), in the introduction to the Task Force’s report recommending comprehensive reform of the state’s indigent defense system. The Task Force, composed of individuals from all three branches of government and a broad spectrum of criminal justice stakeholders, was appointed in 2017 in the wake of the Sixth Amendment Center’s report on trial level services to study the issues raised and to make recommendations for change. Indiana counties and cities are responsible for funding and administering all indigent defense services. Indiana counties (but not cities) may, if they so choose, receive a partial reimbursement from the state for their indigent defense costs — excluding misdemeanors, for which the state provides no reimbursement at all — in exchange for meeting standards set by the Indiana Public Defender Commission (IPDC). However, counties are also free to forgo state money and avoid state oversight. What many Indiana counties have realized is that they can contract with private counsel on a flat fee basis for an unlimited number of cases for less money than it would cost to comply with state standards (even factoring in the state reimbursement). Thirty-seven of Indiana’s 92 counties (40%) choose not to participate in the state’s reimbursement program as of June 30, 2015, more than 20 years after the state reimbursement program began. This hybrid system for right to counsel services, known as the “Indiana Model,” where lawyers for some indigent defendants are required to meet standards conducive to constitutional effectiveness while lawyers for other defendants are not, both institutionalizes and legitimizes counties’ choices to not fulfill the minimum parameters of effective representation required by the U.S. and Indiana constitutions. An uneven application of standards. The Task Force findings confirm what the 6AC uncovered in its 2016 evaluation, along with the results of a U.S. Department of Justice OJJDP planning grant that looked at the delivery of child welfare services. We highlight a few of the findings. In a number of courts, judges do not appoint public counsel to any defendant who posted bond, in direct violation of Indiana Supreme Court case law stating “[t]he fact that the defendant was able to post a bond is not determinative of his nonindigency but is only a factor to be considered.” For example, in all the criminal division and county division courts in Lake County, the judges find every defendant who has posted bond to be ineligible for a public defender. The courts consider it irrelevant whether the defendant made bond with his own resources or whether someone else posted bond for the defendant. Lake County judges were observed to warn defendants who are in custody at the time of their initial hearing that, even if appointed an attorney at the initial hearing, if they subsequently post bail they have to try to hire their own attorney and their public defender may be removed from their case. As one Lake County defense attorney explained, he advises in-custody defendants that it is better for them to stay in jail, because if they post bond they will have to pay for their own attorney. This, of course, needlessly increases the cost to taxpayers to house defendants who are neither a risk to public safety nor at risk of flight. No uniform system for assessing and measuring quality of service and an uneven application of standards: Under U.S. Supreme Court case law, the provision of Sixth Amendment indigent defense services is a state obligation through the Fourteenth Amendment. In Indiana, however, counties are responsible in the first instance to fund and administer services. Although it has not been held unconstitutional for a state to delegate its constitutional responsibilities to its counties, in doing so the state must guarantee that local governments are not only capable of providing adequate representation, but that they are in fact doing so. A need for more attorney training requirements: The Task Force determined that “[w]hile there are many committed, experienced public defenders, and excellent trainings offered by the Public Defender Council, there are few requirements for ongoing qualification and training beyond certain minimal Commission standards, especially in non-capital defense.”This confirms the 6AC finding that the State of Indiana does not consistently require indigent defense attorneys to have training to handle specific non-capital case types. For example, in the counties of Blackford, Elkhart, Lawrence, Scott, and Warrick, there is simply no training provided for or required of the public defense attorneys and no supervision over their work. Inadequate compensation: The Task Force finds that “compensation paid to salaried and contractual public defenders is inadequate and creates economic disincentives to adhere to best practices, such as conducting an independent factual investigation prior to advising a client to enter a guilty plea.” 6AC’s evaluation found numerous problems resulting from inadequate compensation, and the salaried staff attorneys in the Lake County public defender office serve as one example. The lawyers in 2014 were paid a salary of $31,505 per year, and they could be assigned any number of felony cases up to the maximum allowed under the Commission standards, which for these attorneys was 60 level 5 and above cases or 100 level 6 cases (or a prorated mixture). Since each of these lawyers are required to appear in court as a public defender one day each week, they have a financial incentive to handle all of their indigent case work on that one day a week (20% of their professional working hours), leaving the other four days available for more lucrative private cases (80% of their professional working hours). The fewer indigent cases they are assigned, the greater the likelihood of completing their indigent case work on their public defender court day. As his indigent caseload rises, the lawyer earns less money per indigent case, and the lawyer also has less time available for paying clients; all creating a financial incentive for the lawyer to devote as little time as possible to each indigent client. although the state is obligated to ensure effective representation to the indigent accused facing a potential loss of liberty in its five appellate districts, 91 circuit courts, 177 superior courts, and 67 city and town courts, for most of its history, IPDC operated with only a single staff member. In 2014, another staff position was added. No two people, no matter how talented, could ever possibly ensure compliance with standards in so many jurisdictions. The policymakers of each state, in conjunction with criminal justice stakeholders and the broader citizenry, must take responsibility for ensuring the effective assistance of counsel is provided to every indigent defendant in every court, as required by the Sixth Amendment. Indiana took its first critical step when it engaged 6AC, as an independent and outside expert, to evaluate for the first time the system Indiana put in place in 1989 to provide the right to counsel to the poor. And while the 6AC report identified many deficiencies, under both Sixth Amendment case law and national standards, in Indiana as in every state across the country we know that policymakers want to fulfill their constitutional obligations. When an independent assessment allows policymakers to see how far from the mark of Gideon that their indigent defense system has fallen, then the state itself must take up the mantle of implementing sustainable solutions crafted to fit the unique characteristics of the jurisdiction. This is the path that is leading to fulfillment of the Sixth Amendment’s promised right to counsel in many states. In Michigan, an executive branch task force recommended an independent statewide commission with power to promulgate and enforce standards, resulting in $84.1 million in new dollars in 2018. In Idaho, the legislative branch undertook the local review, through the work of the Idaho Legislative Interim Committee on Indigent Defense, and legislation there also resulted in a statewide commission disseminating state dollars to local right to counsel systems. The Utah Judicial Council created a Study Committee on Representation of Indigent Criminal Defendants in that state to examine the delivery of right to counsel services, leading to the statutory creation of the Utah Indigent Defense commission. As shown by these examples from Utah, Idaho, and Michigan, any branch of state government can spearhead improvements in the provision of the right to counsel, but all three branches must work together to see those improvements come to fruition. Indiana has taken this next step through the work of the Task Force. It is ultimately the responsibility of the State of Indiana to provide for effective and competent defense counsel for those who cannot afford representation. Counties are a creation of the state, and the state may continue to delegate some responsibilities to the counties. However, the ultimate responsibility remains at the state level. While making 20 separate recommendations for improvement of its right to counsel system(s), the Indiana Task Force prioritizes three actions for immediate statutory change. Because “[t]he collateral consequences associated with a misdemeanor conviction can be very severe” and the failure to reimburse counties for the defense of misdemeanors has “led to an unequal application of standards across the counties,” the Task Force finds it to be “imperative that Indiana increase oversight of and support to public defenders who represent clients accused of misdemeanor crimes.” Accordingly, the Task Force calls on the legislature to authorize the Commission to reimburse counties for misdemeanor cases. The Task Force finds that “[t]he current system of providing appellate representation in Indiana does not ensure sufficient independence from the judiciary in all counties, . . . the experience and requirements for handling appeals in Commission counties are minimal, and there are no performance standards in place.” To remedy these disparities, the Task Force declares that “[t]he state should fund and manage a centralized state appellate office” to provide appellate representation in all cases that are eligible for a public defense attorney. Much of the current Indiana framework for providing public defense does not need to be changed if the systemic impediments to quality representation identified in previous studies and this report are addressed. However, if counties retain the authority to design and control their public defense system, it is imperative that the state recognize its responsibility to guarantee the right to counsel in all cases where it exists by constitutional provision, state statute, or case law. This responsibility includes oversight for quality and an increase in state funding for this vital public service. If the Indiana legislature acts to fulfill these first three most immediate calls by the Task Force, it is possible that the state might see 100% voluntary participation in the IPDC system by all counties, including compliance with state standards for provision of the right to counsel in every court. On September 25, 2018, the Indiana Public Defender Commission adopted their own legislative priorities consistent with those of the Task Force. The 6AC will keep you apprised as Indiana’s efforts to fulfill its constitutional obligations progress.